Samsung Galaxy S 4G now available on T-Mobile, is the carrier's "fastest smartphone"
Starting today you can get the Samsung Galaxy S 4G on T-Mobile and enjoy download speeds of up to 21Mbps. That is if you get HSPA+ at such blazing fast rates in your area, of course. The Galaxy S 4G arrives in a timely manner, just as expected, and we're looking forward to getting it for a closer look. But in the meantime, we got a chance to play with it at MWC, so why don't you check out our brief hands-on here. 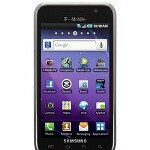 The nation's fourth largest carrier offers the latest addition to the Galaxy S lineup for $199 on a 2-year agreement. You can get it online or in store, but the handset should be available also at retailers like RadioShack, Wirefly, Walmart and others, which might offer a better deal for the handset. Question however remains whether the innovations in the S 4G provide enough ground for an upgrade if you already own a Samsung Vibrant (T-Mobile's reincarnation of the Galaxy S). Basically, the handset only differs by offering faster data, a front-facing camera and support for Wi-Fi calls. To lure you into a purchase, the phone comes with the iconic movie Inception preloaded. All of that paired with the handset's HD movie playback capabilities requires some additional power and that's why the Galaxy S 4G packs a 1650mAh battery, up from 1500mAh on the Vibrant. Is this enough for you to get the latest addition in T-Mo's lineup? Let us know in the comments! Tempting.... i hope the GS2 when it arrives for the carriers has a bigger battery! I hate it when they show videos that you really don't see or learn anything but the reporter holding it and turning in around in their hand. If you can't show what the device can do, don't bother. If we want to see what the device looks like, we can check out commercials for it on YouTube. luis, 21mbps is based on the THEORETICAL MAX. Hence the disclaimer that "actual speeds may vary". i get 5-6 on my 3g vibrant, my wife gets 6-11 on her 4g G2. Sprint's wimax has a theoretical max of 12 with a real world of 4-7. And they charge extra for that. VZWs LTE has a theoretical max around 30 somewhere (im sure someone will correct me, hint hint), and when it gets some phones on it, it will probably run around 7-15 in real world tests... but it hasnt so far. Out of all the "4g" carriers, Tmobile is winning the speed tests, even against LTE for now. Their fastest smartphone with the slowest updates. I currently have the T-Mobile Vibrant and like it. The new S 4G is faster and I'm considering going to it. The one thing holding me back is wondering if the newly announced Galaxy S II is coming to the USA and if so, if it's coming to T-Mobile. The specs I've seen so far do NOT have the T-Mobile UTMS 1700 band on it. Anyone know? Rob, I would assume that the galaxyS 2 will be on every carrier just like the last one. You wont see a version that has Tmobile's radio (as they are the only ones using it) until the Tmobile specific version is outted. I would hold off if your on the fence. The new galaxyS 2 brings a lot more horsepower, bigger screen, and new features to the table. I got this phone yesterday and I love it! It has a pretty cool design on the back and really light weight and the screen is absolutely amazing!